A Inteno DG200AL router protects your home network by blocking unwanted incoming internet connections and acting as a basic firewall. Sometimes you need to open a port in your router in order to get a good connection for a game or to use a specific device on your network. The DG200AL lets you choose the applications that are allowed to connect through an open port. By opening a port in your router you allow a specific application or game to send data from the internet to your home network. Set up a static IP address on the computer or device that you are forwarding ports to. Go ahead and log in to your Inteno DG200AL router. Find the Port Forwarding section in your Inteno DG200AL router. Click on the Network tab at the top of the screen. Find the Firewall tab at the left of the screen and click it. Click on the Port Forwarding link at the left of the screen. Create a Port Forwarding entry. If the process of forwarding ports in your router seems difficult to you, you are not alone! Do not get discouraged. Let us walk you through the steps for opening a port in the Inteno DG200AL router. Just follow along as we lead you through the process of opening a port in your router. It is important to set up a static IP address in the device that you are forwarding a port to. This ensures that your ports remain forwarded even after a reboot, power outage, or other type of device or router disconnect. The Inteno DG200AL router uses a web interface to display router settings. In order to login to the Inteno DG200AL router you need to use a web browser. Open your favorite web browser. If you don't have a favorite or are not sure what this means, open up Chrome, Firefox, or Internet Explorer. If you are already in a browser window, go ahead and open up a new tab. Find the address bar in your browser window. This is usually found at the top of the page, like in the image below. In the screenshot above you should see an address bar with the address of 192.168.1..1 in it. This is your router's IP address, sometimes called the computer's default gateway. Enter your router's IP address into the address bar of your browser and click the enter button on your keyboard. A box like the one below should appear. Enter the username and password for your Inteno DG200AL router. Note: If you have changed these numbers in the past, you will need to enter in the those values. Once you have entered your username and password, remember to click the Sign In button to login to your Inteno DG200AL router. If the username and password that you typed in did not work, check out our Default Inteno Router Passwords page for other ideas about possible passwords. If, after trying the above list of passwords you still can't log in, you may need to reset your router. Learn how to do that by reading our How to Reset a Router guide. After resetting the Inteno DG200AL router your username and password are reverted back to factory defaults. Router settings may also change when you reset, so make a note of your current router settings before you reset. 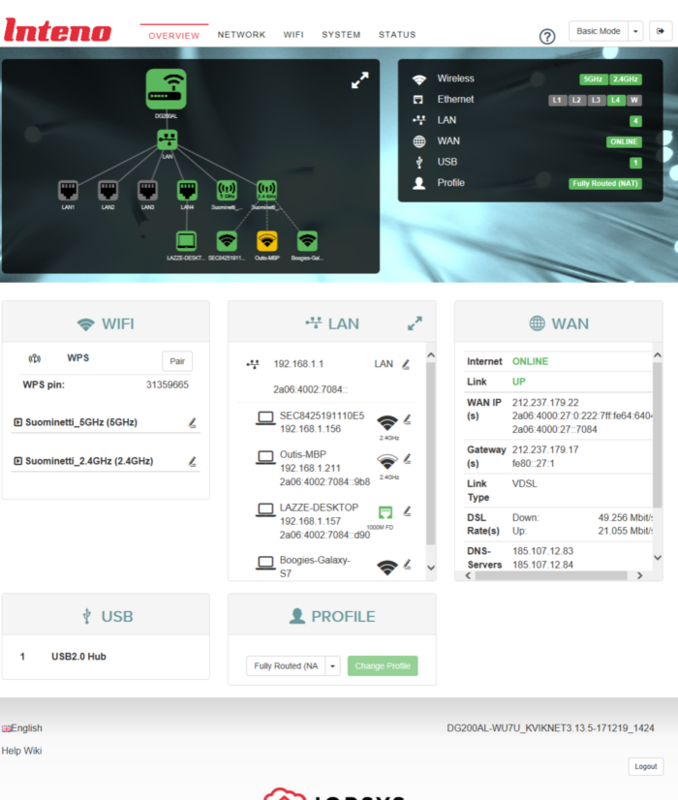 After successfully logging in to your Inteno DG200AL router you should see the router's home page on your screen. Find the Port Forwarding section of your router. Click the Network tab, which can be found at the top of the screen. Find the Firewall tab at the left of the screen and click on it. Click on the Port Forwarding link, which can be found at the left of the screen. You are now on the Port Forwarding page. Make sure that it is necessary for you to open a port in your router before doing so, since this will allow data to come through the firewall portion of your router to a specific device. It is possible that this could lead to malicious traffic on your network. However, don't let this warning stop you from making this change if you need it because the risk is very low. Make up a name to put in the Name box. The name does not have any effect on the functionality of the forward, it's simply there so you can know why it was created. In the Dst. IP box, enter the IP address that you want ports forwarded to. This may be the IP address of your computer or the IP address of another device on your network that you want to forward ports to. In the Protocol dropdown box, select the protocol type of the ports you are forwarding. Choose Both if your router has that option. Otherwise, select either TCP or UDP as needed. If you need to forward a port for both TCP and UDP and your router does not have the Both option, then you need to create two entries. You can enter either a single number or a range of numbers in the Public Ports box. 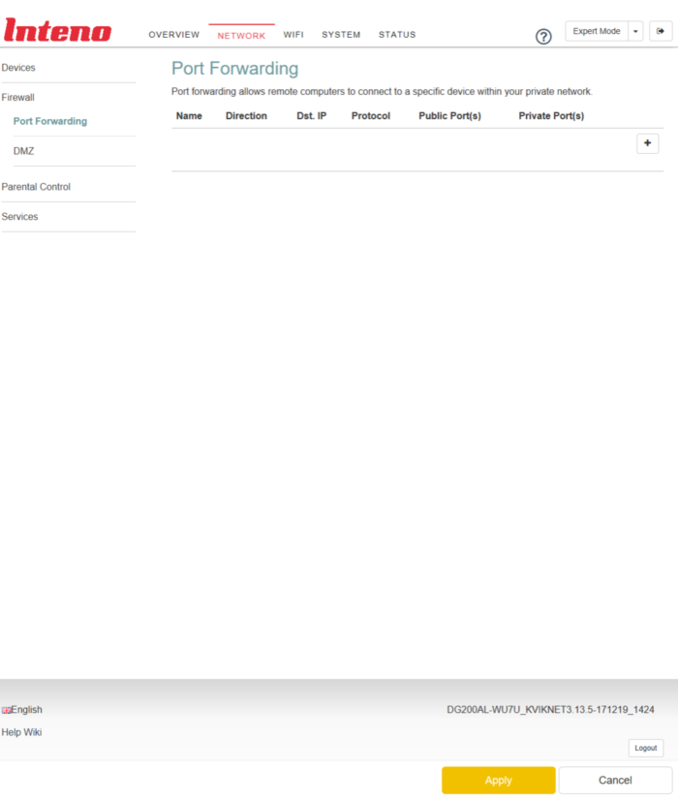 If you are forwarding a single port number you can enter it into the Public Ports box. To forward a range of ports you can enter the lowest number of that range into the Public Ports box, followed by a hyphen, followed by the largest number. An example would look like this: 1000-2000. Enter the exact same values that you put in the Public Ports box, into the Private Ports box. Click the Apply button at the bottom of the page to apply these changes when you are completely finished. Use our Network Utilities software, (which includes a free Open Port Checker tool) to test your network to see if you have forwarded ports in the Inteno DG200AL router correctly. Open Port Checker is the only online port checking tool that has Guaranteed Results. Our software called Network Utilities does all of this and more. Find detailed tips on how to Setup your router.